Our customers know that SteveYoung’s Tree Service can go to great lengths, and heights to trim and if necessary remove trees from their property. For one unique job a couple of weeks ago, however, we had to be careful not to fall into unexpected depths. 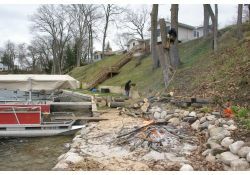 The owner of a waterfront home on Pine Lake asked us to remove a large but dead ash tree on the shoreline. Unfortunately, the tree was just off the beach at the bottom of an embankment. I took one look and realized we weren’t going to cut that tree down in pieces and haul it back up the embankment. Did I mention this tree was large? Clearly, this job called for an amphibious assault.